The news has been warmly welcomed by charity figureheads such as Concern CEO, Tom Arnold, who described the gesture as ‘extraordinarily generous’ and hailed the pair for what he called their ‘immeasurable’ contribution to charity. U2 frontman Bono is believed to be worth in excess of one billion dollars, a sum accumulated through the groups massive commercial success over the past thirty years as well as through shrewd business investments (it was reported recently that the Irish rock star made a $300 million profit after selling his 5% stake in social media behemoth Facebook). For his part, Geldoff has amassed a fortune estimated by the Sunday Times Rich List at being in excess of £80 million, three hundred pounds of which was earned during his time as a musician. Ironically the former Boomtown Rats frontman amassed the vast majority of his wealth as a result of his involvement with the Live Aid project in the mid 80’s, where several fading pop acts donated a few hours of their time to raise their profiles, as well as some money for an African dictator. Although his band had enjoyed modest success prior to the event, Geldoff only struck it rich after the 1985 fundraiser for the humanitarian crisis in Ethiopia, when he founded several television production companies and used his new found popularity to secure highly lucrative contracts. In the statement the pair said they would be surrendering all of their wealth and revealed they are looking forward to ‘seeing how the other half live’. Bono, who currently resides in a palatial family home in the affluent suburb of Killiney in South Dublin with his wife and five children, said he intends to relocate to the distinctly less salubrious surroundings of Dublin’s North Inner City, an area characterised by 40% unemployment and some of the highest heroin addiction rates in Europe. Geldoff has made similar plans to ‘downsize’. The father of three says he intends to sell off his properties in New York and the South of France as well as his Kensington home. It is not yet known where the one-time husband of Paula Yeats plans to move, but he was recently seen entering the offices of an estate agent in Toxteth, Liverpool. The news will come as a timely riposte to the pair’s growing band of critics, who had accused the rockers of crass hypocrisy. In addition to the 1985 fundraiser, Geldoff helped stage a follow-up charity concert in 2008 (Live 8) and has never been shy when it comes to lecturing political leaders about what he sees as their ‘indifferent attitude’ to African causes. 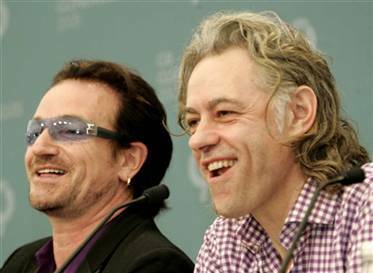 Bono, for his part, came under heavy criticism in 2009 when U2 moved their primary business holdings to the Netherlands in order to avail of lower tax rates there. Indeed, the singer has used his fame to pontificate on all manner of issues throughout his career, ranging from debt forgiveness for African countries to larger lollipops for the lollipop ladies of his local primary schools (a cause he brought to a successful conclusion after a guest appearance at last years G8 summit in France). Whilst the duo’s decision has been almost universally welcomed, two girls who seem rather less enamored with the news are Geldoff’s daughters, Pixie and Peaches. The pair are understood to be ‘devastated’ at the news, meaning as it does, that they will now have to get actual jobs – something they may well find to be more difficult than they first realise, owing to the fact they have no discernable talents whatsoever. For her part, Pixie seems to have come to terms with her new status sooner than her sister as she was spotted enrolling for a twice-weekly woodwork course run by the local council. In a day of extraordinary gestures, Titanic star and famed environmentalist, Leonardo Di Caprio announced plans to give his $20 million Beverly Hills mansion to a local homeless charity, while he relocates to a nearby woodland area to ‘live at one with nature’. Meanwhile Sudan activist George Clooney, has made public his plans to use all his money to buy DVD players for the entire population of the oppressed African country, along with copies of all his movies. Whilst Clooney conceded that his gesture wont alleviate Sudan’s dire food shortage, he insisted the movies would provide a welcome, light-hearted escape from reality for ‘at least a few hours’.